In Tennessee, the Worm-eating Warbler, which breeds on the Gorge's steepest slopes, is listed as a "species of concern". How can we protect this fragile population? Birds are an indicator species, which means if they're not healthy, there's a lot more that's not healthy! 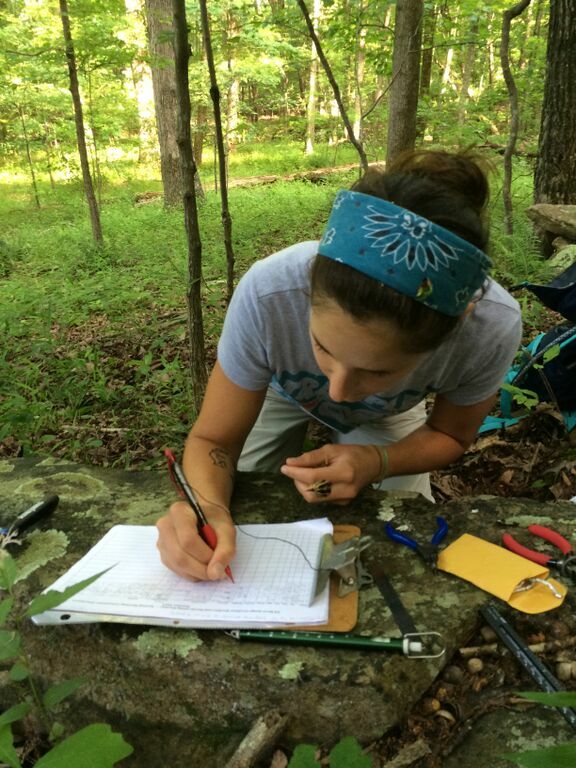 With a generous grant from Benwood Foundation, the Trust's Holland Youngman conducted research in the Tennessee River Gorge from May 2014 through May 2016, focusing on Worm-eating Warblers. The focus of this survey was both population numbers as well as post-fledging foraging habitat needs, i.e. what the young birds need when they come off the nest. The Trust will use the data gathered in this project to determine best management practices for stewarding our forests to promote productivity and survivorship for these at-risk birds. During the spring and summer months of 2014-2016, Holland conducted a study on the post-fledging habitat use of Worm-eating Warblers in the TN River Gorge. This neotropical migratory species is currently considered stable worldwide, though its numbers have been declining in Tennessee. Worm-eating Warblers spend the breeding season in eastern North America’s large tracts of mature, unfragmented forests. With continued destruction and fragmentation of the habitat upon which it depends, this species (along with many others) will likely face declines in the decades ahead. The post-fledging period, or the time after the young birds leave the nest and before they disperse for fall migration, is a crucial life stage for growth, learning and survival. It is also a stage lacking in data, as it is difficult to track and study the juvenile birds given their cryptic coloration and behavior. The Gorge provides expanses of continuous, mature forest, making it an ideal breeding and study area for Worm-eating Warblers. Holland used ultralight (0.31 gram) harness-attached VHF transmitters to track fledglings daily on properties throughout the Gorge and gather data on their habitat use and movements. The results of the study indicated that degrees slope (gradient of a hillside), leaf litter depth, shrub density and percent herbaceous cover are significant characteristics of fledgling Worm-eating Warbler habitat. Daily movements averaged 49 linear meters and moved down slope. By understanding crucial habitat components and movement patterns, conservationists can better protect and manage lands to bolster post-fledging success. Such actions are critical in the effort to maintain viable and successful species populations into the future. Holland is a native of the South Carolina coast, and a graduate of Clemson University. She has enjoyed working environmental conservation jobs in Wyoming, Mississippi and Texas; and left her position with the SC Department of Natural Resources in Charleston to move to Chattanooga. 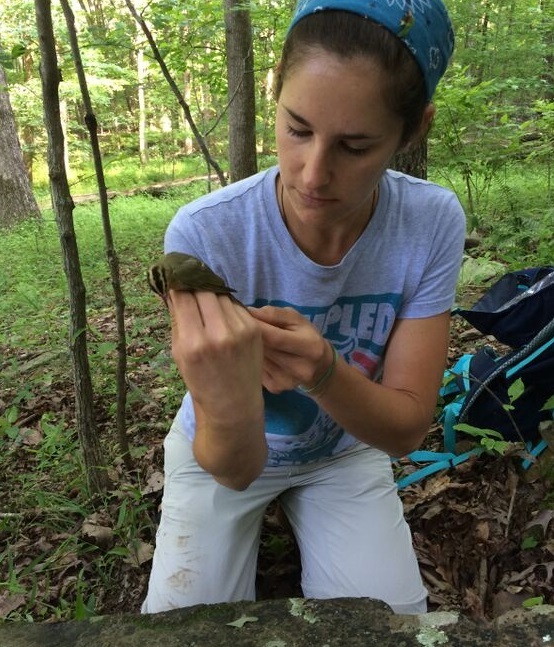 She is thrilled to be here, where she recently received her Masters of Environmental Science degree at UTC while working with the TRGT conducting Worm-eating Warbler research. We got local photographer Kevin Livingood out to the bird-banding lab to take photos. Here are the beautiful shots he came up with! The Trust partnered with Olive Bean Natural Grocery & Cafe to host a dinner in celebration of the bird research the Trust has recently conducted. April, owner of Olive Bean, served Colombian black beans & rice with spiced briscuit, sweet fried plantains, and pineapple polenta cake. We had a great turnout, as you can see. We plan to have more collaborative events in the future, so stay tuned to our event page! WORM-EATING: The Trust is in Get Out Magazine! Sunny Montgomery at the Times Free Press's publication Get Out Magazine wrote an article about us! Read it here.